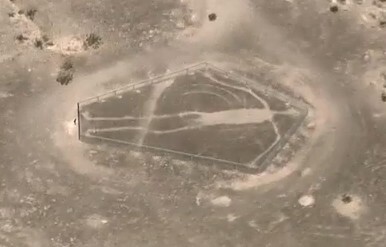 17,000 Cultural Sites, including petroglyphs and extremely large earth drawings known as geopglyphs in southern California may soon be destroyed thanks to Chevron, Solar Millenium, Florida Power and Light, Next Era™ and various other companies. Now held in trust by the BLM (Bureau of Land Management), these sacred sites being cast aside so these companies can build massive solar projects under a “fast tracked process” put in place by the American Recovery and Reinvestment Act (AARA) program. In this excerpt from “Solar Gold,” Alfredo Acosta Figueroa, an Elder, Tribal Monitor and historian from the Chemehuevi Peoples, describes the importance of these Sacred Intaglios, how they were made and what they mean to Indigenous Peoples. Figueroa also offers a humble suggestion on how they can be projected. Cultural sites aren’t the only thing at risk. Dr. Jim Andre, Director of the Granite Mountains Desert Research Institute, in a recent interview with Lundahl, stated that these new solar projects could severely impact the environment, so much so that he suggests the possibility of ecosystem collapse. “Rather than be smart from the start by utilizing ecologically degraded sites first, a reckless and scientifically unmerited decision has been made to instead race into our most pristine desert and obliterate some of the most botanically significant lands in California. “The project hemorrhages the very heart of the biologically rich eastern Mojave Desert where plant diversity rivals that of the primeval coastal redwood forests of the Pacific Northwest. An area treasured by scientists throughout the world for its unparallelled pristine quality among deserts, and recognized as one of the last functional ecosystems left on planet earth. “The project relies on mitigation concepts with no scientific foundation, and on statements of overriding consideration that sets a very low bar for how our generation chooses to transform how we generate energy while cohabiting the planet – indeed we have hastened the very ecological destruction for which the ISEGS project is meant to mitigate.